Around 20,000 cases of septic arthritis occur in the U.S. each year. But what is septic arthritis, and how does it develop? Septic arthritis results from bacteria that travels into our joints; knee joints are especially susceptible. It isn’t just wear and tear on a joint and/or an autoimmune condition that can cause arthritis. A subtype called septic arthritis can develop if bacteria enters the body and travels through the bloodstream to a joint. Septic arthritis tends to occur most often in the knee joint; it’s also common in the hips and shoulders. Symptoms include pain that can be severe, along with some swelling. Patients with the affliction may find it difficult to move a joint, and also can develop a fever. Septic arthritis can occur in an acute form and a chronic form. Septic arthritis can be traced back to infections like hepatitis A, B, and C, herpes, and human immunodeficiency virus (human HIV). It also can develop after injury to a joint or after any type of surgery, particularly joint replacement surgery. You may be more susceptible to developing septic arthritis if you have a chronic illness such as diabetes or rheumatoid arthritis, which depress the immune system, or if you take immune-suppressing medications like those used to treat rheumatoid arthritis and cancer. Animal bites near a joint also raise your risk for the condition. The bacterium most likely to cause acute septic arthritis is Staphylococcus aureus. 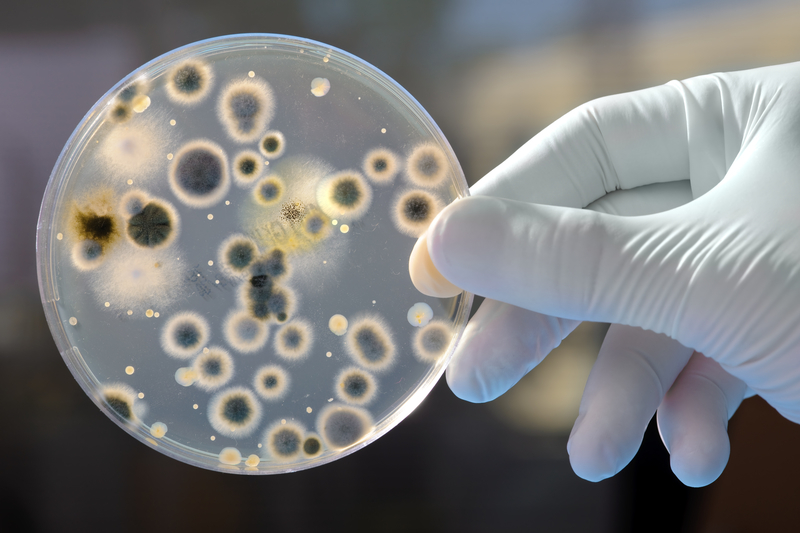 This bacterium is present on the skin, but most people suffer no ill effects from it. However, if you develop a staph infection (for example, in your throat), the bacteria can travel to your joints. It also can enter the skin through a puncture wound or through sores that may develop if you have psoriasis or eczema. Infections causing septic arthritis also can develop during surgery (even with medical personnel practicing rigorous hygiene) or after surgery. Symptoms of an infection in your surgical incision include soreness after the wound had appeared to be healing, and the presence of pus. If you’ve recently had surgery and suspect you may be developing an infection in the wound, alert your doctor. Streptococcus pneumoniae also can cause septic arthritis, so be sure to protect yourself from these bacteria by getting immunized against pneumonia. The condition’s chronic form is less common, and can be caused by Mycobacterium tuberculosis and Candida albicans. 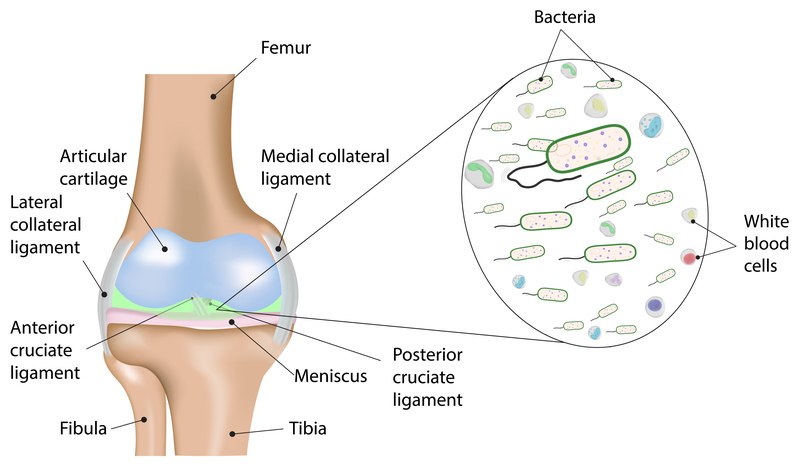 Above: Illustration showing introduction of bacteria into a knee, causing septic arthritis. Who Is Most at Risk for Septic Arthritis? Septic arthritis is most common in infants and in adults age 65 and older. In fact, older adults make up about 45 percent of all cases. This is likely due to a combination of reasons—for example, our immune system wanes with age, making older adults more vulnerable to infections that can result in septic arthritis. Older adults also are more likely to undergo joint replacement and other surgical procedures, and are more likely to take medications that suppress the immune system. The skin also becomes more fragile as you age, making it easier for bacteria to enter the body and cause septic arthritis. In order to diagnose septic arthritis, your doctor will take a blood sample to check for infections; he also may use a syringe to draw off some of the fluid surrounding the troublesome joint. The fluid will be analyzed for the presence of white blood cells and whichever bacteria may be causing your septic arthritis. Once you’ve been diagnosed, your healthcare provider typically will prescribe antibiotics to help clear the infection. The joint also will need to be drained of fluid in order to help clear the infection and preserve the cartilage in the joint. If needle aspiration is not effective, your doctor may recommend surgery to drain the fluid, typically using arthroscopy or “keyhole” surgery. The technique involves a small incision through which a camera device is inserted into the joint for viewing, and another small incision through which suction tubes can drain fluid. If you have septic arthritis in your hip, you may need open surgery to drain the fluid, since it’s difficult to gain access to the hip joint using arthroscopy. antibiotics, arthritis, bacteria, cancer, cartilage, diabetes, eczema, hepatitis, hip joint, immune system, infection, joint replacement, knee joint, pain, pneumonia, psoriasis, rheumatoid, rheumatoid arthritis, septic arthritis, skin, staph infection, tuberculosis, virus, white blood cells. I thought you might be interested in this article on https://universityhealthnews.com: What Is Septic Arthritis?